Why I ask. WHY? 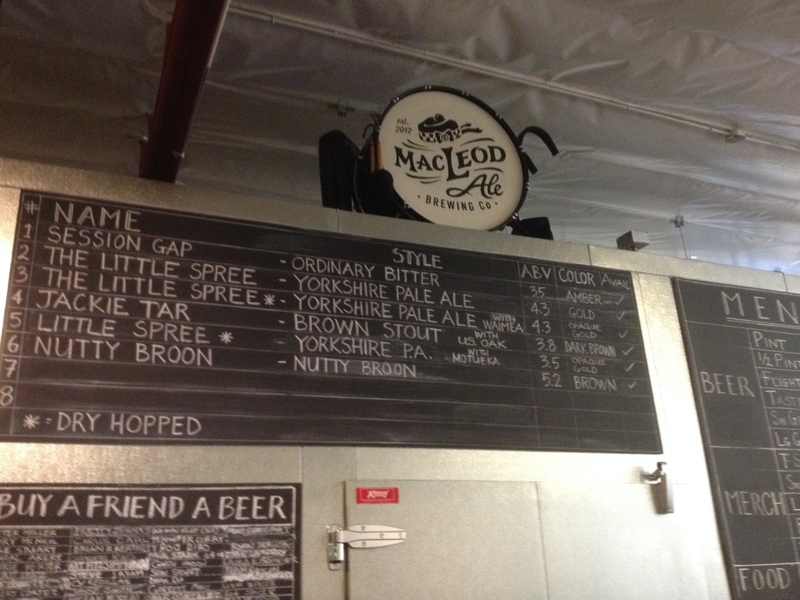 I recently visited Macleod Ale Brewing Company http://www.macleodale.com/home.html in Van Nuys California, and I have been asking myself this question ever since. “Cask ale or cask-conditioned beer is unfiltered and unpasteurised beer which is conditioned (including secondary fermentation) and served from a cask without additional nitrogen or carbon dioxide pressure”. 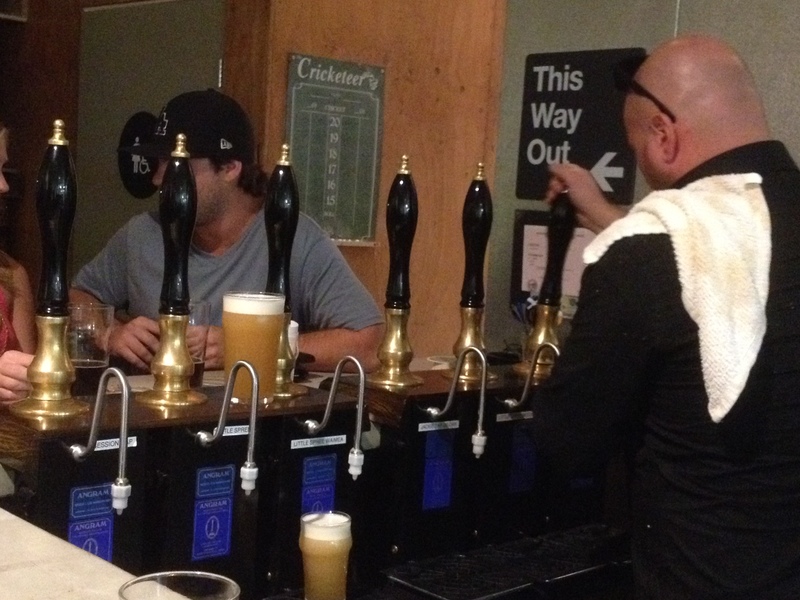 This means there are no kegs serving up the beer, just a line of these really cool hand pump things, serving the brews. I find that cask beer makes me less full. Less bubbles mean less bloaty feeling. Back to my visit…. How excited was I, the self proclaimed Queen of the Session beers to see a line up of ALL session beers! 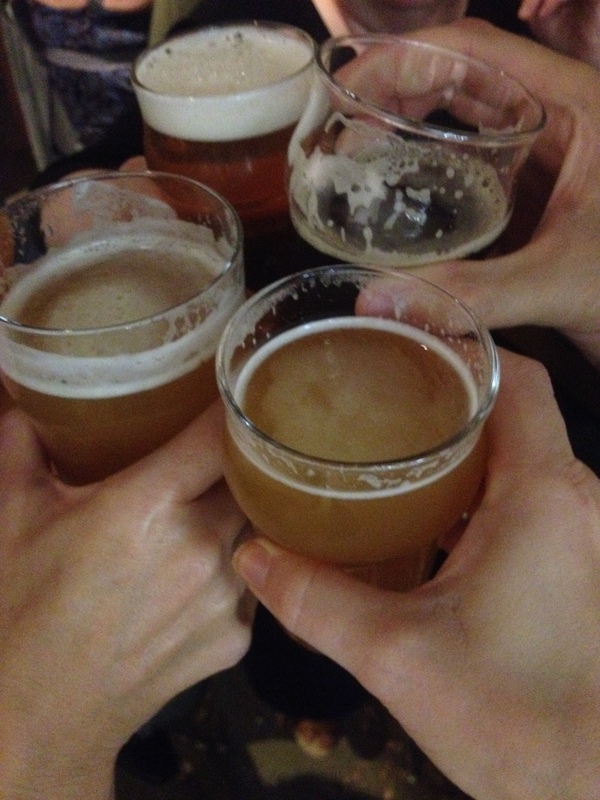 Session beers if you recall are beers with a lower alcohol percentage or low ABV. Now I like this cause you can drink more (like when you are outside drinking all day during the summer, or hanging in a pub all afternoon) and you don’t end up face down under the barstool. But also for all you folks out there who order 2- 12% beers and that’s it for the night and think you are saving calories, are you? Heres the deal. A higher percent means higher alcohol which was caused by more sugar in the process. Soooooo really you drink 3- 4% beers that’s the same calories as one of those 12% you just drank. 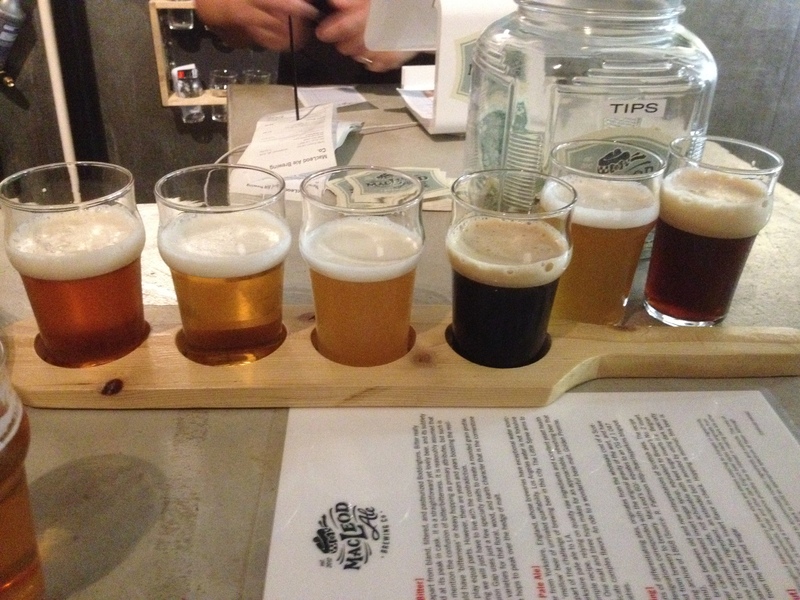 Back to my visit….How excited was I to taste a flight of these beers and find out I loved, not just liked but LOVED every single one of them. When does THAT ever happen? The beers were just so damn good. 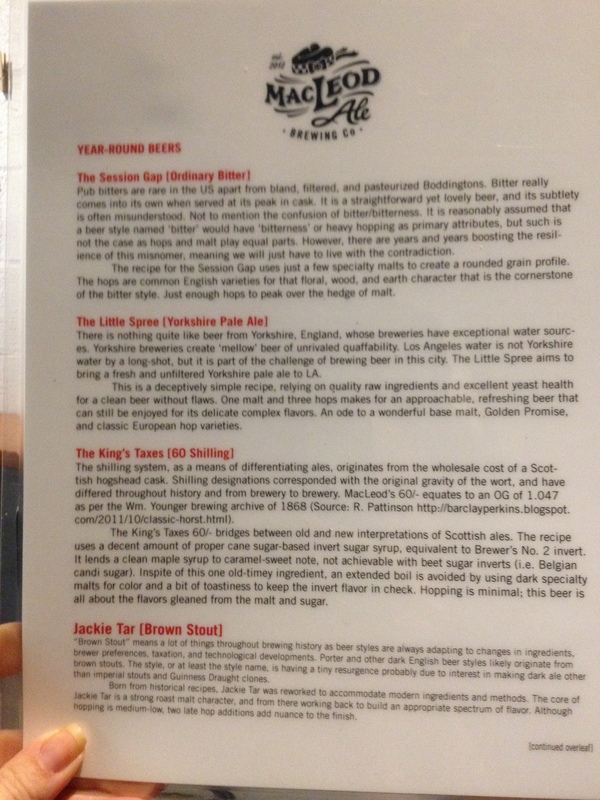 I would almost guarantee those of you reading cause you are slightly intrigued to find beers to replace your mild tasting not to out of the box, Bud and Coors but you aren’t quite sure that’s possible…. would love these beers. This place stands for exactly what Im trying to prove. You don’t need to continue drinking beers that have been around for 100 years anymore, you can find a great beer, lighter, not in your face hops, not over the top pine clove -insert any other crazy spice they are putting in beers to make them different- here, same ABV, same look and feel of your comfort beer and its going to taste sooooooo much better. And you get to support small businesses! Back to my visit….so the brewery isn’t right out there. No brewery really is. Unless you are a really big one you probably wont be seen right away. 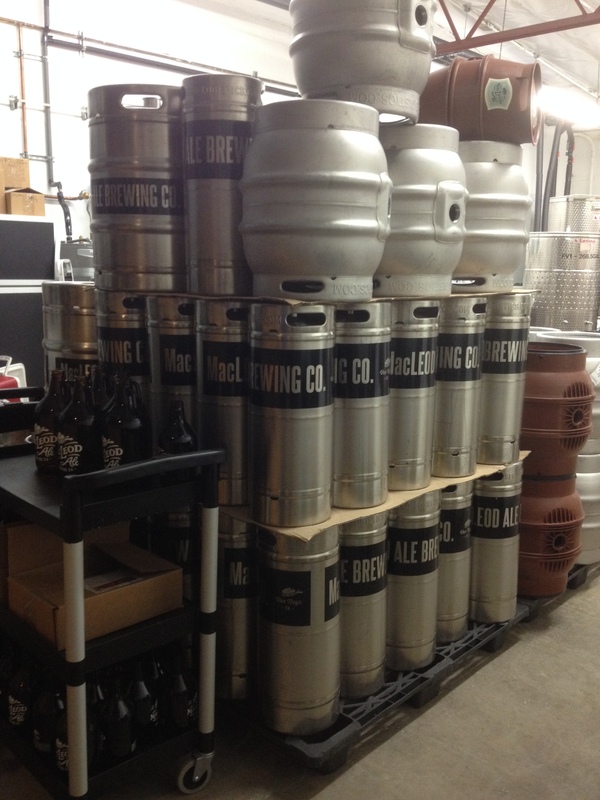 Breweries by law have to be in industrial areas, and this is no exception. In the middle of Van Nuys down a smaller street, Calvert you have to look on your right to spot it but its there. Once in you see it’s a great spot. So fun. Peanut shells on the floor, board games all around. 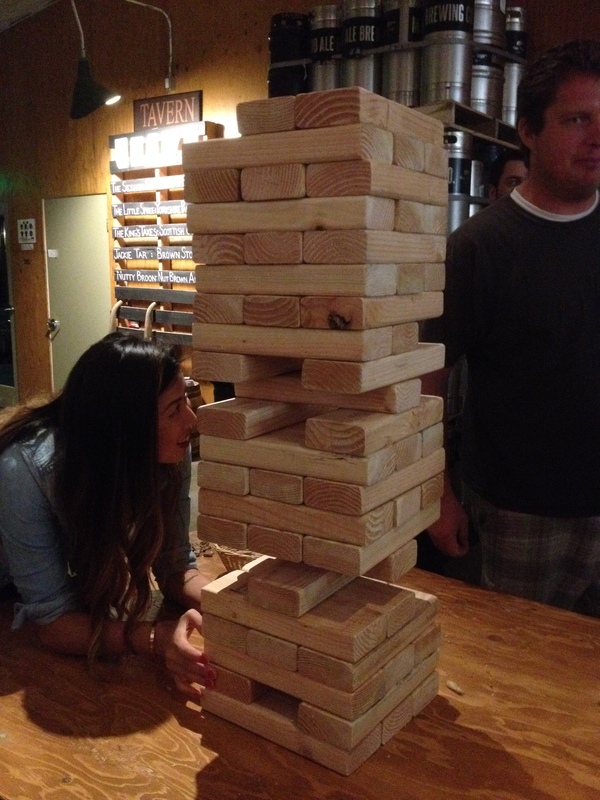 Tables of people playing Jenga (which is a pretty fantastic game after a few pints if you think about it). You can see the brewery making the beers as you sit. That’s kinda awesome. There is no food being served as of yet, but they are known for their BYOC (Bring your own cheese) as in addition to copious amounts of peanuts they do have crackers available. They serve up very economical flights, pints and half pints. I personally love a good half pint especially in a place like this where I want to drink them all. Session Gap, The Little Spree (3 versions), Jackie Tar and Nutty Broon. The Session gap was a tradition English Style Bitter or if you see this on a bottle, called an ESB. Since we haven’t chatted about ESBs, an ESB came from brewers who wanted to differentiate their ales from other mild brews, so they use pale malts and more hops. I really liked #5 (see pic). 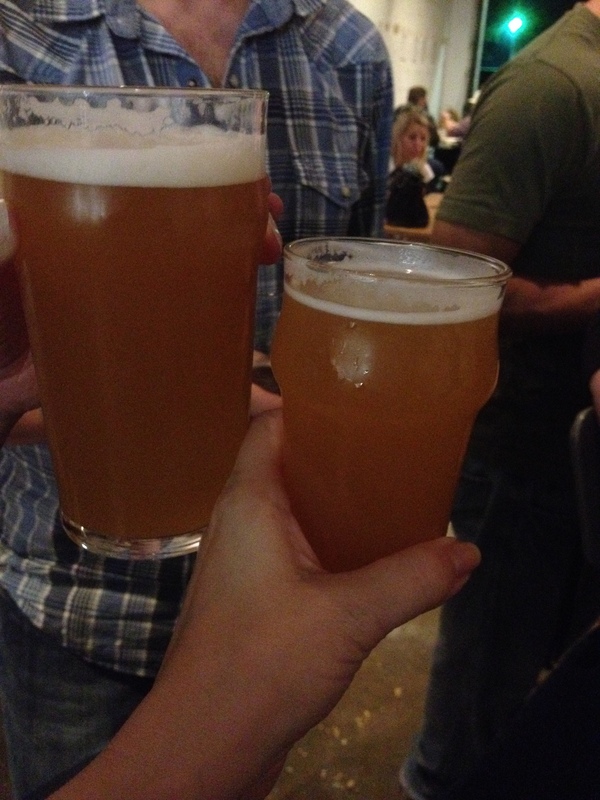 As did my non “beer” fan gal pal I was with. She ordered more than I did! It was The Little Session Spree that had been dry hopped. The Little Sprees were Yorkshire Pale Ales, I had to look this one up, as I was not familiar so thank you to their menu.. There is nothing quite like beer from Yorkshire, England, whose breweries have exceptional water sources. Yorkshire breweries create ‘mellow’ beer of unrivaled quaffability. Los Angeles water is not Yorkshire water by a long-shot, but it is part of the challenge of brewing beer in this city. 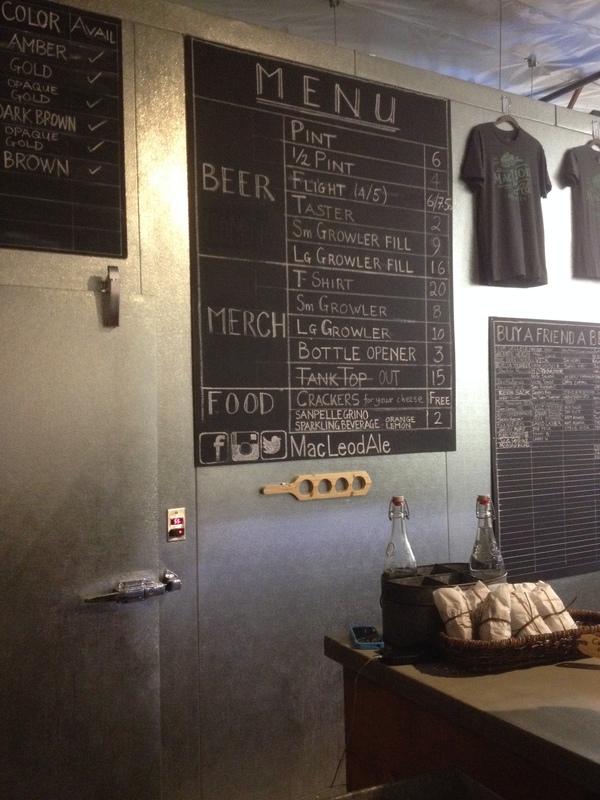 The Little Spree aims to bring a fresh and unfiltered Yorkshire pale ale to LA. The Little Sprees are Pale ales, remember how I said Pale Ales are the gateway to IPAS. Well these were gateways to Session IPAs, all the great flavors with a super low ABV and they were so freaking well balanced. I feel like I give IPAs a bad rap for being so bitter and hoppy to me. But the thing is, if the brewer knows what they are doing they know how to balance the hops and the malt to make a fantastic beer. That’s what happened here x 3. Side note: Not to get too technical, but Im all about learning, so: dry hopping means when they add hops after fermentation. It doesn’t add extra bitterness, just added aroma and I for me, flavor. 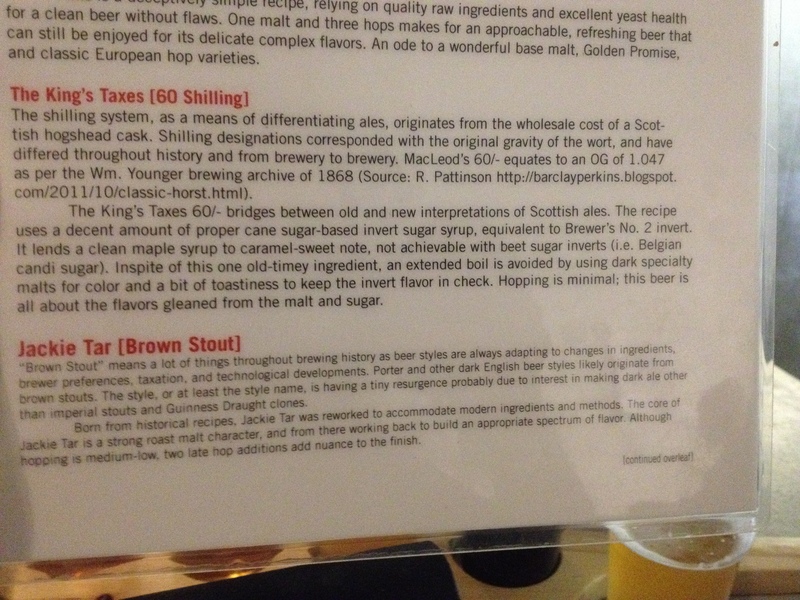 The Jackie Tar was a brown stout, but when I say Stout don’t think full blow Guinness. Much lighter, and more brown than its Tar name indicates. The Nutty Broon is a brown. Now see Im not a huge fan of browns. (NewCastle would be a good example) they generally run too caramel like for me. But again this was fantastic. Light, yummy, and even at 5.2% I could drink it all day. Over all I can’t speak highly enough of this beer. I encourage you all to find them and like them on Facebook. https://www.facebook.com/MacLeodAle as they are always posting about fun things they are doing, Vampire Bingo, Board game night, and what food trucks will be parked out front. 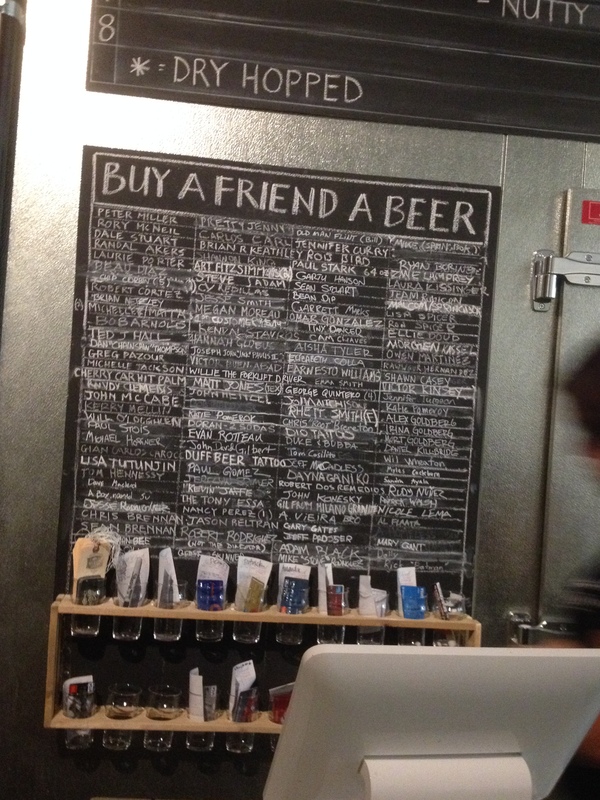 Oh and check out their “Buy a Friend a Beer” Board. You can pre buy a beer, put your friends name up there and they can come in anytime to claim their pint. I wish I could have left you all a beer…next time. Of course I asked, as the Bierboys join me on occasion for tasting and it is okay to bring your well behaved no drinking child with you. They are open at noon on weekends, don’t bring your kids at night, they should be at home in bed. But remember they don’t serve food, so plan accordingly. And so I find myself wondering WHY did it take me so long to visit…months of great beer have been lost for me. Sigh. 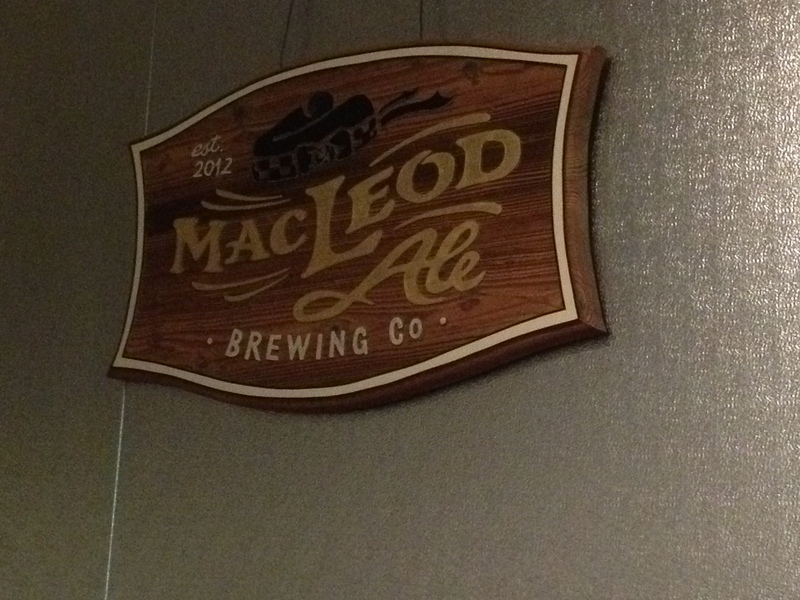 But glad I found you MacLeods! 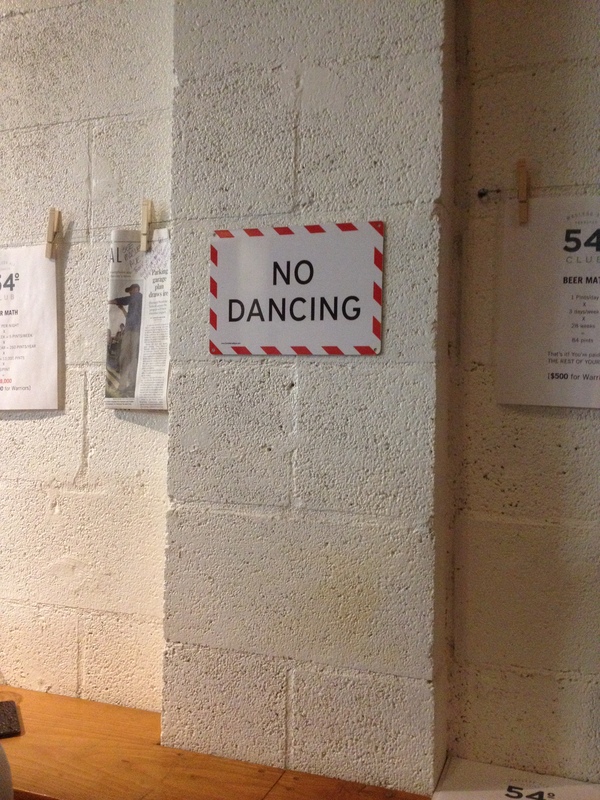 One question for the folks at MacLeod’s.. Whats up with the Footloose rules?